First World War Centenary News in Kent & Medway | A Blog for everyone wanting to join in and do something for the FWW Centenary! A Blog for everyone wanting to join in and do something for the FWW Centenary! Screen South would like to thank all those involved in the making of this film, something which we are very proud of, and we hope that you too will enjoy and appreciate the film’s significance in telling the stories of Kent in WW1. For more stories from WW1, visit the http://kentww1.com/ website. Exciting news for the Historical Research Group of Sittingbourne (HRGS) who have recently moved into The Heritage Hub at The Forum in Sittingbourne. The Group were successful in an application to HLF’s ‘Then & Now‘ fund to create a digital Roll of Honour display of local men who fought in the First World War. 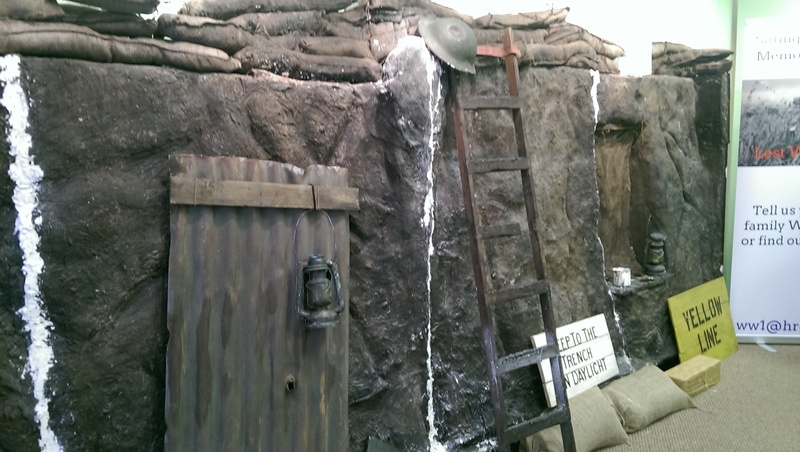 The hi-tech touch screen (from InfoAktiv) containing hundreds of records and images, is now on display at The Heritage Hub, as well as a life-size replica of a First World War trench, created by students at the University for the Creative Arts. Read more about the work of the HRGS and their First World War research on their website. Are you looking for First World War displays and educational presentations to bring your event to life? The team from ‘They Shall Grow Not Old’ may be the ones for you. 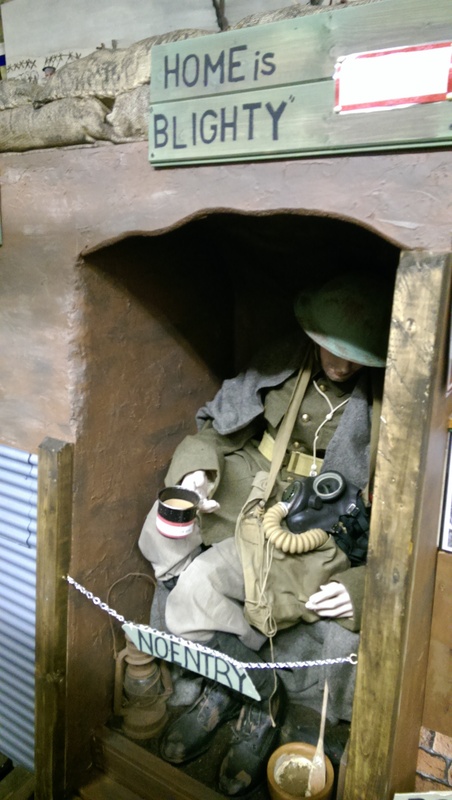 We offer comprehensive ‘Show & Tell’ interactive displays of First World War artefacts, equipment, posters, weapons (all weapons used are deactivated) and uniform to add background atmosphere of an event, with opportunities for ‘hands-on’ artefact handling and discussion with visitors. We encourage event organisers to ask visitors to bring in their own memorabilia of the First World War – including family photos, medals, letters and other items. We can help identify and date these while placing them into context within the wider events of the War. Looking for a speaker for your event? 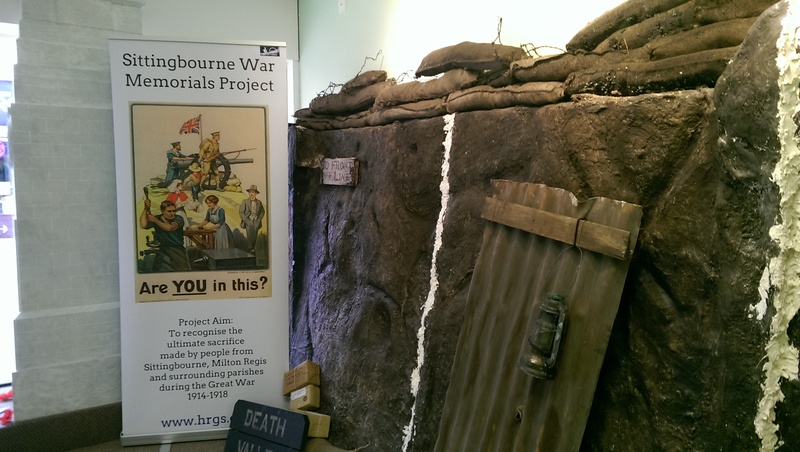 We can offer a ‘Learning Conversation’ about life for soldiers during the First World War supported by our extensive displays. We are able to provide interactive presentations on a range of First World War subjects specifically tailored to any audience from schools to universities, clubs and societies, and the workplace. Our presentations are the perfect way to start a First World War project, support an exhibition of pupils’ or students’ work, or as a ‘scene-setter’ in preparation for a visit to the battlefields of Europe. In return for a donation to our chosen charity – The Forces Children’s Trust, we are able to provide help in researching the history of those who served during the First World War. Please note: there is a charge for these services but all monies raised will be donated to our chosen Charity – The Forces Children’s Trust. On Friday 16th January, over 50 of us gathered at the University of Kent to hear from the ‘Gateways’ team. We heard from Dr Sam Carroll, Community Heritage Researcher, who introduced the Gateways centre, its aims* and how it can and has supported various community projects. For example, Dr Will Butler from the university’s School of History, shared his experience of working with the Simon Langton School in Canterbury; and Ernie Brennan from the National Children’s Football Alliance with Dr Emma Hanna talked about Gateways support of the Peace Fields Project. We also heard from Dr Zoë Denness (Gateways team) and Jon Beer (School of History) about how University of Kent students and other volunteers could get involved in your project. Student Ruben Rees told us how he had volunteered at Canterbury Cathedral Archive and supported them in their First World War research. We were also joined by: members from the Dover Museums & Arts Group (DMAG) who talked about their ‘Codename: Joined Up‘ First World War project; and from Blue Town Heritage Centre, the Royal Engineers Museum and Viola Films who described how they managed their joint ‘For the Fallen’ project. Don’t forget, the Heritage Lottery Fund’s ‘Then & Now‘ funding strand is still open for applications. *’Gateways to the First World War’ is a centre for public engagement with the First World War centenary funded by the Arts and Humanities Research Council (AHRC). 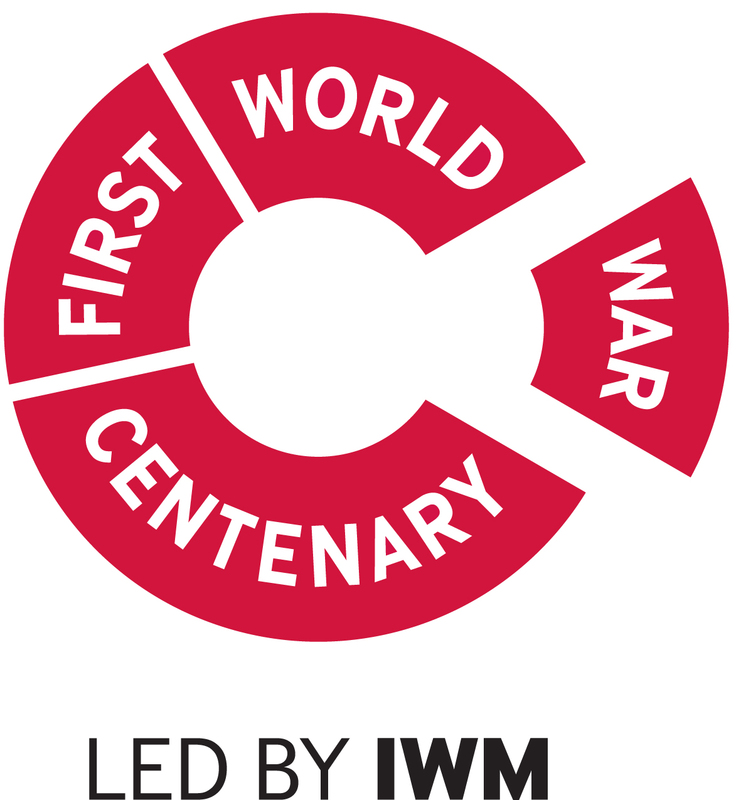 The aim of the Gateways team is to encourage and support public interest in the centenary of the First World War through a range of events and activities such as open days and study days, advice on access to materials and expertise, and signposting for other resources and forms of support. ‘Blood Swept Lands and Seas of Red’ at the Tower of London, created by artists Paul Cummins and Tom Piper, marked the centenary of the outbreak of the First World War. The Tower’s dry moat was filled with 888,246 ceramic poppies – one for each British fatality during the war – from August to November 2014 to mark the Centenary. Read more about the poppies on the website http://poppies.hrp.org.uk/. I have been following the story of this incredible installation from the beginning, watching in the media as the sea of poppies developed. I visited the Tower in October last year and was amazed by the number of people gathered to see the work and hopefully we assume, show their respects. 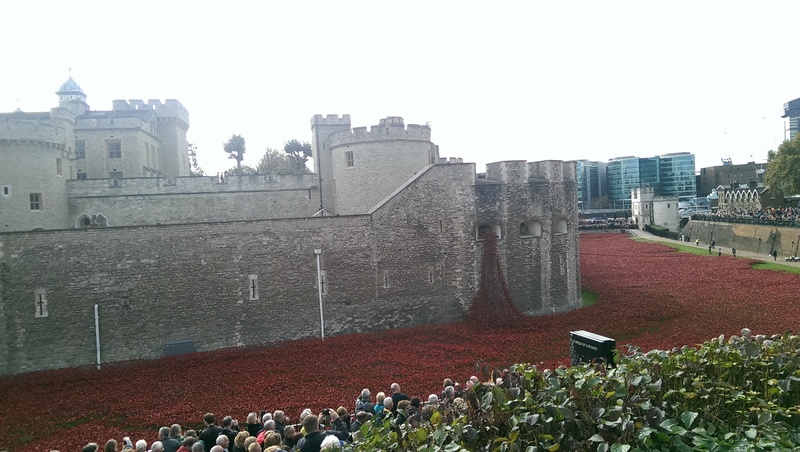 All the poppies were sold to individuals across the world and started to be removed following Armistice Day. There are many fantastic images of the poppies and their new owners on social media, (Twitter using hashtag #TowerPoppies), and I am very proud to be one of those people, having my received my poppy on Christmas eve, a poignantly timed reminder. There has been lots of positive press about the work, but there has also been concerns along the way around where the money from the sale of the poppies would end up, with articles revealing that only a third of money will be going to charity. There was also further negative press when the delivery company, Yodel, delivered broken poppies. Did you visit ‘Blood Swept Lands and Seas of Red’ or purchase a poppy? What are your thoughts on the debate over the funds raised as part of this project? Have you booked your place for ‘Exploring Gateways’? 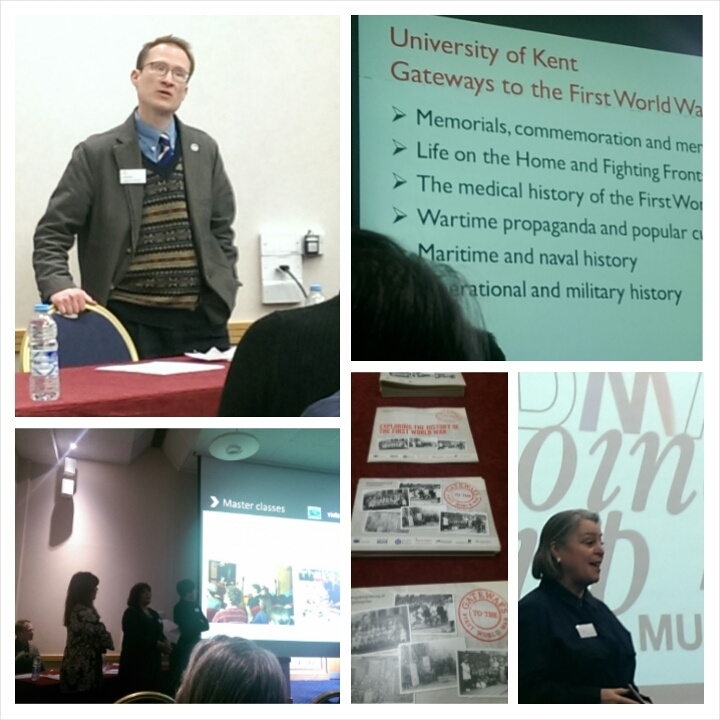 Following on from successful First World War networking events in 2013, the Museum Development Programme has partnered with the AHRC-funded ‘Gateways to the First World War’ project, hosted at the University of Kent. Gateways is an AHRC-funded centre for public engagement with the First World War centenary. The centre is managed by the University of Kent in partnership with the Universities of Brighton, Greenwich, Portsmouth, Leeds and Queen Mary, London. It also has close links with organisations such as the Imperial War Museum, National Maritime Museum and the War Memorials Trust. The aim of the Gateways team is to encourage and support public interest in the centenary of the First World War through a range of events and activities such as open days and study days, advice on access to materials and expertise, and signposting for other resources and forms of support. In this afternoon session being held at the University of Kent on Friday 16th January, we invite you to meet the ‘Gateways’ team and hear about projects they are supporting and how they could support your own FWW projects. Find out what it is, how is it funded, who is involved, why was it set up, what the aims are, what can the university offer, and how can it support community groups. Hear how University of Kent students could support you with your project, from student Ruben Rees. If you’ve been inspired to work with the Gateways team, where do you go from here? 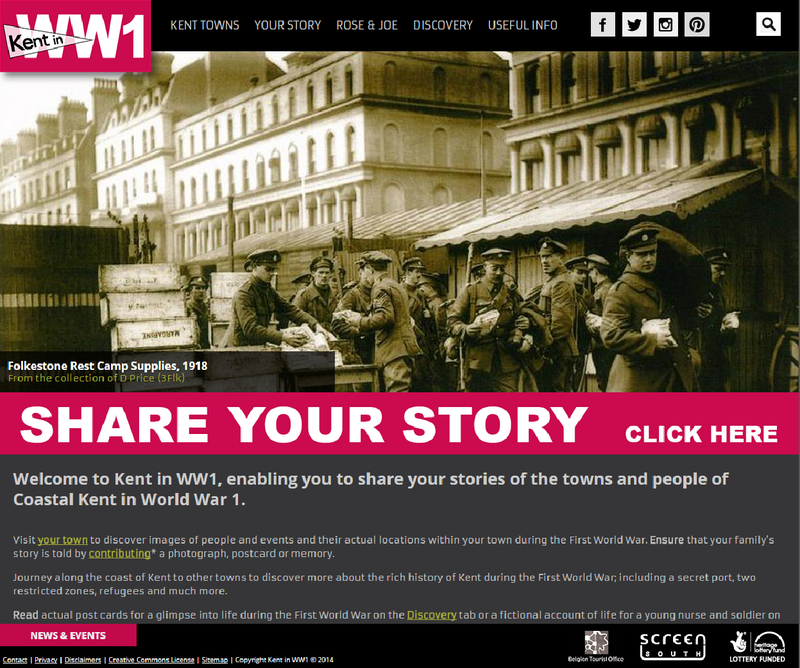 The exciting new website, Kent in WW1 (http://kentww1.com/) developed by Screen South in partnership with communities and organisations from across the Kent coast, is now live. It is the culmination of a successful Heritage Lottery Funded project that began in 2013. 14-18 NOW, WW1 Centenary Art Commissions, has announced that it is seeking a wide range of new proposals for extraordinary new art commissions to be created in response to the centenary of the First World War. The search for new proposals follows the success of 14-18 NOW’s first wave of commissions which reached at least 16.7 million people over the eight weeks leading up to 4th August, the centenary of the day Britain entered the First World War. Ashford Borough Museum build a trench! 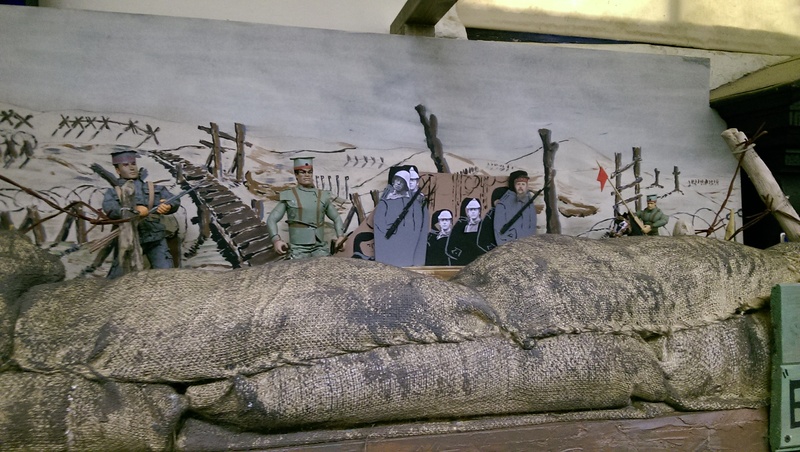 With sights, sounds and smells from the Western Front, this small but effective display, built for only £150 by museum volunteers, really captures the imagination of children and adult visitors alike. Find out more about Ashford Museum on their website. A new website has been launched which publicises Gateways news and events, encourages and supports public interest in the centenary organises open days and study days, advice on access to materials and expertise, and signposting for other resources and forms of support. Take a look at the new site at http://www.gatewaysfww.org.uk/.